Avg'd 201 today, 191 overall. Doubles partner had a couple 190s and a bad 156 game, man so close!! finished 1157, which as of now is 30th place? our team finished w/ 2586, so we're in the top 100 at least, for now. Outside of the 10 board, an it wasn't coming back, inside of 15? and it was goin left, hard left. Threw straight @spares cuz the hook shot too unpredictable. Yeah the shot is tough for sure, an not all that consistent. plan on making continuous adjustments. other notes: Nevada law states EVERYONE must be buckled up in the car, so keep that in mind if u'r driving or uber'ing. Southpoint: Really south of the strip, was not impressed w/ the buffet. Course once u've had the lobster/prime rib buffet @Valley View Casino in SoCal, everything else kinda pales in comparision. Tried the prime rib restaurant, that was actually pretty good. heard a lot of the places are over priced. 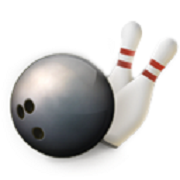 If u r staying at the hotel, apparently bowlers get a special rate, $57 w/ usbc card? also u get a coupon book, which has a 1/2 price buffet coupon, add a players club card an get an additional discount, which for me, made the buffet $5 for lunch. Prolly best to use the 1/2 off coupon for the seafood buffet @dinner. Can't seem to find any link to "low to cash" numbers? Does anyone know where this info is now, or has that been done away w/ just like the pre-publishing the oil pattern an live streams? Not sure, Rick used to post those numbers in the past. I have not seen anything this year, I wonder if they are not doing this year? I talked to a USBC official today and the low to cash numbers will be posted starting next week. USBC typically updates low-to-cash online on the 1st & 15th of the month during the tournament, so I'd say look for it on Thursday. Like I said, this should be updated on the 1st & 15th of the month (and, likely, after the end of the tournament instead of July 15). Walter Ray shoots a lil over 1800, I see a couple 170s in there. 2017 USBC Senior Masters last week with over a 240 average. Latest low-to-cash (linked previously) said an estimated prize fund would be posted on July 1, if people have been looking for that. Scroll down and you'll see the links for all divisions and estimated prize funds.